Sioux Falls (pronounced "sue falls") is a city in the U.S. state of South Dakota. It is the largest city in the state; 153,888 people lived there at the 2010 census. The city is in the eastern part of South Dakota. It is the county seat of Minnehaha County, where most of the city is located. The southern part of the city is in Lincoln County. 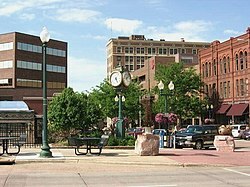 Sioux Falls became a city in 1876. The city is built around the Big Sioux River, and it gets its name from a set of waterfalls along the river that are located in a park in the city. Sioux Falls is home to four major sports teams. The Sioux Falls Skyforce play basketball in the NBA Development League, the Sioux Falls Canaries play baseball in the American Association, the Sioux Falls Stampede play ice hockey in the United States Hockey League, and the Sioux Falls Storm play American football in the Indoor Football League. Two major Interstate highways go through Sioux Falls. Interstate 90 goes from east to west, and Interstate 29 goes from north to south. Sioux Falls also has a shorter route, Interstate 229, that serves the eastern part of the city and connects Interstate 90 to Interstate 29. The city is also home to the Sioux Falls Regional Airport, which has flights to many big cities across the country. ↑ 1.0 1.1 "American FactFinder". United States Census Bureau. Retrieved 2013-06-02. ↑ "SD Towns" (PDF). South Dakota State Historical Society. Retrieved 2013-11-23. ↑ "Falls Park". South Dakota Department of Tourism. Retrieved 2013-11-23. This page was last changed on 25 January 2019, at 01:51.